So in this article, I am including four products where you can place hay inside or are made up of hay. These kinds of items will provide so much enrichment and make it a bit different for the guinea pigs to eat their hay. I have not tried all of these items, but I have picked based on how safe they look to me and how good other customer reviews are on them. Click on each image and it will take you to the product, for the cuddle cup click on the title. This is a product I have used with my syrian hamster, so it was the smaller version. My hamster Henry just loved it. Looking at the reviews on Amazon UK, guinea pig owners have said how much the piggies enjoyed them. I wouldn’t give them this everyday because they will be eating too much carrot, which is full of sugar, so once a week is best. The roof is covered in the carrot and then the walls have edible card covered with hay. This is an excellent product for them to go up onto and really get them using their teeth. It’s a nice hiding place as well. The measurements are 27 by 20 by 18cm. Beware this could be destroyed quite quickly. I have done a review on a HayPigs product and was impressed, so I have decided to include this hay feeder that they sell. Available on the Pets at Home website. Measuring 23 by 22 by 12cm, is a circus themed wagon that can hold any type of hay inside. The guinea pigs will love pulling the long stems out between the bars that are well spaced and keep them entertained. It’s all closed up properly and made with safe materials. It’s a perfect bed to place hay into, to make an even more comfortable experience. Made out of hyacinth and rattan, they are safe for guinea pigs to chew. If they have trouble getting in through the opening, just place a fleece pad under, so they can walk up. It measures 33 by 26cm and could fit two. I like the look of this, because it’s a nice natural product. A ladybird pattern bed made from the comfy material of fleece. Nice and cosy for them to sleep in and you can make place a small layer of hay inside. It’s reversible to have the red on the outside and the ladybirds for the inside. There is wadding to soak up urine. You can choose to have the bed with the wall all the around or to have an opening. Two removable pads are included, so they can be washed separately from the bed. Measurements are 26cm diameter and 10cm tall for the walls. It’s a lovely handmade product made right here in the UK and can be purchased from Etsy. I love how cute the Guinea Pig House looks, but I am wondering, what ingredient is used to stick the hay together such that it stays compact and stay in shape? If left there for the guinea pig to munch on, it can probably last for days or weeks, will it get mouldy? Do they state how long it can last outside? But one thing is for sure: the guinea pigs will have a great time with this creative presentation of their food! Hello, that is a good question, but unfortunately I cannot find what is used to stick the hay together. It’s not on the amazon description, but it is safe, as my last hamster would have these all the time. No it doesn’t go mouldy, again when I had these for my hamster, it would be in its cage for months. Probably because it has dried carrot on the top and how its been made, it should keep inside or outside for a long period of time, being many months, but they would probably be demolished quite quickly. 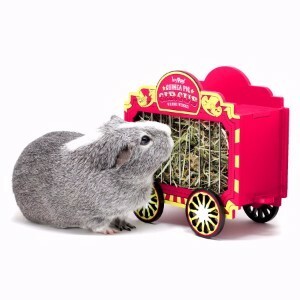 It is a great item for Guinea Pigs to keep them happy. Those are the best. I love the Rosewood Naturals Carrot Cottage and the HayPigs Wheek Wagon Small Animal Hay Hopper. The wagon is the best. I could totally imagine dressing up the guinea pig in a clown suit. How cute would that be? I also like that our pigs can eat their house. They are always nibbling on things. Guinea Pigs do love a bit of a nibble, some more than others. The house would keep them entertained for a good period of time. Great post and wonderful info. Really, the pig already looks so cute and combined with the house it has no words about the cuteness! We had 2 pigs but we lost them because the cold and we didn’t had a proper house. But we want to buy 2 new pigs because really, they’re so adorable! They do look really cute and comfortable in a little house. A house is a great and must purchase for Guinea Pigs, they love them. Your two new Guinea Pigs would appreciate them and sounds to me that you would give them a good life. How cute is that Carrot Cottage! Its a fantastic idea. Its a house until the guinea pig has eaten it haha. I assume this may last a while in the guinea pigs hutch? The cuddle cup is a fleece bed – for sure this is handy in the colder months. My guinea pig needs one! I haven’t used the carrot house for my Guinea Pigs, but I have read on reviews that the persons Guinea Pigs demolished and ate the house quite quickly. Depends on the guinea pig really, some might just leave it for a while and then have a nibble again after a little time. I do love the fleece items and your guinea pig would love it. If peoples Guinea Pigs are outside over winter apart from when it gets really bad weather, the cuddle cup would be a nice warm addition to a hutch.